iZotope acquired the "Exponential Audio" product line! 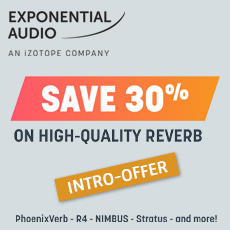 These reverbs are world-class multi-channel plug-ins trusted by audio professionals in music production, post production, and sound design. R2 Surround carries on the stereo version’s reputation for full-bodied reflections and introduces a multichannel upgrade. R2 Surround gives you control over every piece of your reverb signal with level and EQ controls for early reflections and reverb tail, plus in-depth Attack, Tail, and Early Reflections modules to fine-tune the size and timbre of your reflections. The Chorus and Gate modules can be used to produce a greater sense of motion in your reflections for effective and engaging spatial effects. Your music production deserves a reverb tone as unique as the music itself. R2 employs a reverb algorithm designed to color and compliment stereo music productions, making the reflections themselves a musical element. With a comprehensive and precise control set, R2 has everything you need to put the final polish on your next music project, no matter the genre. Give your reverb some character - R2’s rich, musical reverb algorithm introduces more movement to the reverb tail, producing unique, expressive reflections like chorused guitar textures, dark rooms, vibrant vocal halls, and more. Get creative with modulation and dynamics effects - Use the Chorus module in R2 to create different textural effects, or the input-driven Gate to dictate exactly where and when your reverb is most prominent. Spatial reflections you’ve never heard before - R2’s preset bank blends classic plate, room, chamber, and hall reflections with tail modulations to create exciting, dimension expanding spatial effects. The SP2016 offers a Natural and Distinctive Sound!